"We're descending towards Hill Valley, California at 4:29PM on Wednesday, October 21st, 2015." Wow, we've finally arrived - the future! What a day! October 21st, 2015. At precisely 4:29PM today Marty, Doc and Jennifer will be flying above us in the DeLorean. Hill Valley is about to get some time-travelling visitors. 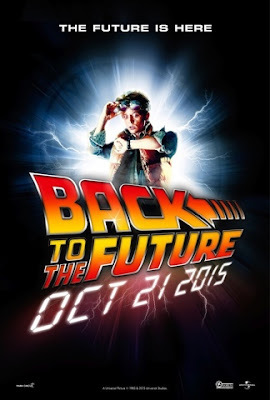 I find it rather fitting that I sit here in 2015 writing a 'Back to the Future Day' post on my aptly named blog. While I've been quiet on Back to the Film this year, I couldn't let a momentous day like today go by without writing. It's a celebration after all! Never again will we, the Back to the Future fans, get to experience this coming together of movie and reality. From here on out, BTTF2 will no longer reside in the future. From now until the end of time, we'll be looking back. The Hill Valley of 2015 will become the stuff of history, just as the 1955 and 1885 versions did. Can you imagine a world without the existence of the Back to the Future Trilogy? These movies have meant so much to me that they've become real, in the greatest way possible. When I've been sad, I've sought solace in Hill Valley; Marty and Doc never fail to brighten my mood. One of the true joys of my life is my ability to lose myself in make believe. Good movies transport me straight to their worlds. I immerse myself in the details and I'm right there with Marty, enjoying every minute. So today, especially, is cause for celebration. October 21st, 2015 is upon us. We've closed the gap between make believe and real life. Just for today, Hill Valley is right outside our door. So don your power-lacing shoes and grab your auto-drying jacket. Marty and Doc will be landing soon!